Despite the all-round gloom about the successful hosting of the 2010 Commonwealth Games in Delhi from October 3 to 14, Organising Committee chairman Suresh Kalmadi exuded confidence. While several countries have raised doubts on the Indian security arrangements for the upcoming Commonwealth Games, the Australian cricket team has endorsed it by claiming it to be one of the finest. The depleted JCT crashed out of the title contention with their 2-0 drubbing at the hands of ONGC in their second Group C league encounter in the 32nd Federation Cup played at Guru Nanak Stadium here today. Australia vice captain Michael Clarke is confident of beating India on Indian soil. “Undoubtedly, India is a very tough team to handle under sub-continent conditions, but we will win the series,” he said. After Yuvraj Singh, the Central Excise Department has now tightened the noose around the necks of five more cricketers, including spinner Harbhajan Singh, for the non-payment of service tax on their earnings in the Indian Premier League (IPL) series I and II. World chess champion Viswanathan Anand does not wish to become part of the chaos and controversy surrounding the Commonwealth Games here and only wants to focus on the number of medals India would win in the October 3-14 event.“I really don't want to become a part of all this (mess). I don’t wish to comment on what’s going on. At the moment, I am just hoping that we (India) win lots of medals. I am concerned about our medal tally. Regular practice and perseverance are the success mantra for Sangrur girl Mankiran Kaur, who has been selected as a member of the Indian swimming team to represent the country in upcoming Commonwealth Games (CWG). The third edition of the Airtel Delhi Half Marathon, 2010, the world’s most prestigious half marathon, an IAAF ‘Gold Label’ event was launched in the city on Tuesday by Sanjay Kapoor, CEO-India, & South Asia, Bharti Airtel. 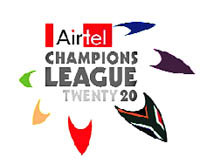 It is going to be a battle between Mahendra Singh Dhoni's spirited leadership and the strategic acumen of experienced Anil Kumble when their teams Chennai Super Kings and Royal Challengers Bangalore take on each other in the Champions League Twenty20 semifinal here tomorrow. Despite the all-round gloom about the successful hosting of the 2010 Commonwealth Games in Delhi from October 3 to 14, Organising Committee chairman Suresh Kalmadi exuded confidence and said he was “happy with the progress made in the Games Village” as it got ready to welcome the first batch of 7,000 athletes and officials, who would reside there during the Games. Kalmadi said as many as 121 Indian athletes and team officials from five disciplines and 17 para sport athletes and team officials were slated to check into the Games Village this evening. “I am sure that they will find the Village in good condition,” Kalmadi said, after having overseen the deployment of an extra work force to clear up the mess at the Village and sweep it spick and span. “I spent time at the Games Village this morning and am happy with the progress made by my team with the support of the government agencies in bringing up all 32 towers in the Village’s residential zone to standards that would be acceptable to all our honoured visitors,” Kalmadi said, adding that most of the overseas teams were expected to arrive tomorrow. Some foreign athletes are expected to move in tonight. The Indian athletes who moved in are 17 archers, 20-member men's and women's hockey teams, 21 gymnasts, 23 weightlifters and 17 para sport athletes. He said, “There will be no serious complaints anymore, and we believe that no team will pull out of the Games”. “I am happy to note that we have already completed delegation registration meetings (DRMs) with 21 teams and more will be completed in the coming days. I have met the chefs-de-mission and team managers from these teams,” he added. Kalmadi admitted that there were some problems in some of the newer buildings of the residential zone because of the copious rain that Delhi had received this reason. “We are making good progress,” Kalmadi said, before rushing off to the airport to receive Commonwealth Games Federation president Mike Fennell, who is expected to visit the Games Village tomorrow morning. Kalmadi said the training facilities, athletes’ dining hall and international zone were all world class and he was confident that the foreign athletes would enjoy their stay in the Village. The CCG member-nations and territories who have completed the delegation registration meetings included Australia, Canada, Cook Island, England, Isle of Man, Jersey, Kenya, New Zealand, Nigeria, Northern Ireland, Scotland, Solomon Islands, Tanzania, Uganda and Wales, Trinidad and Tobago, Norfolk Island, St Lucia, Cameron and Guernsey. The final entries are confirmed by these countries and territories in the DRMs meetings. The Organising Committee also received a massive boost when Australian Sports Minister Mark Arbib and Commonwealth Games Association and Australia's Chief Executive Perry Crosswhite said their country remained committed to contesting in the Games. Crosswhite said the idea of withdrawing from the Games was not discussed by his government. “No, not at all,” he emphasised, adding that Australia's accommodation at the Games Village was acceptable while acknowledging displeasure of other nations with their facilities in separate blocks. “There are things that need to be corrected. I'm comfortable...as long as the hard work that has started now is maintained and probably increases. There are a number of defects that need to be fixed, but its not like buildings are going to fall down or anything,” he added. But he was hassled by the heavy security at the Village. “Heavy security around the Village was an issue--not for any lack of safety but for expediency. The security, which is really tight, needs to be bedded down to some extent. It's friendly, but it's just massive and it needs to be more efficient letting people through, in and out. Because when you get large numbers here, it is going to be a hassle if it doesn't get fixed”. Expressing satisfaction over the arrangements made for them, team members claimed that contrary to the ongoing belief of the country being terror stricken, it is safe and apt for hosting any kind of games. 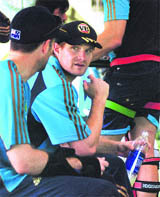 Echoing his teammate, Australian vice-captain Michael Clarke said the team was satisfied with the security arrangements. “In fact, the arrangements (security) are fantastic. We are comfortable here. We always get looked after very well in the country,” said Clarke. Other team members, including off-spinner Nathan Hauritz, Steve Smith and Phillip Hughes were of the view that they have no clue why there is so much of hue and cry about the security issue. Notably, many star athletes are not coming to India due to risk of terror attacks during the Commonwealth Games. The depleted JCT crashed out of the title contention with their 2-0 drubbing at the hands of ONGC in their second Group C league encounter in the 32nd Federation Cup played at Guru Nanak Stadium here today. Youngster Lalmaun Puia of ONGC, who impressed everyone with his performance in the first match against Dempo, struck twice in the 15th and 81st minute to seal a victory for his team. He was equally supported by Badmas Baba Tunde, but he could not find the back of the net. For JCT, the lone goal came from the foot of Ajay Singh in the 73rd minute. 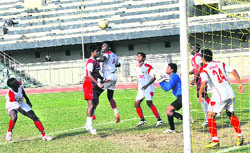 In the previous encounter Dempo Sports Club thrashed AIFF XI 1-0 and topped the Group- C.
The leading goal scorer, Ranty Martins Dempo SC, who was ridding high after his triple strike against the ONGC in the previous encounter, proved his mettle again and pumped in two goals to lock the match. The Nigerian striker along with mid-fielder Roberto Silva aka Beto put the relatively younger AIFF-XI on the back foot and earned a penalty. Ranty had no problems in sending the ball towards the back of the nets. He scored again in the 74th minute to ensure top place in the group. “We are excited to play with them and have fullest opportunity for the preparations of the matches,” said Clarke, who has played 62 Test matches so far. However, he said pacer Zaheer Khan and off spinner Harbhajan Singh would be the main threat for the visiting team. “Harbhajan has a very good record against us in the longest form of the game. Similarly, Zaheer is wonderful bowler and can produce reverse swing with the old ball,” he said. “With some fresh and inexperience faces in the team, we have to come up with a strategy to combat these two. We need to play as best as we possibly can,” he said.“Definitely, the series would be a top learning experience for the young players of our team,” said Clarke. Clarke, who would be the next possible skipper, dismissed the idea that present skipper Ricky Ponting had any plans of retirement soon.“Ponting is in a good shape and fit. I think the best cricket from him is yet to come,” he said. When asked about the spot-fixing allegations of late, the all rounder was of the view that the game was in safe hands. “At the moment, there were only allegations. I think consequences would be very strong if someone proved guilty,” he said, adding that this was not a new thing for the game as it had experienced it in the past also. According to sources, summonses have been issued by the Chandigarh Central Excise Department to Harbhajan Singh, TP Singh, Gagan Deep Singh, Karan Goel and Sarabjeet Singh for the non-declaration of service tax dues. The cricketers have been asked to appear before service tax officials and declare their earnings for both IPL I and II. Once they made declarations, service tax due from them would be calculated and demand notices issued for the payment. Sources said the summonses were issued to five cricketers as they had failed to respond to the written communications sent by the department for declaration of their service tax dues. Interestingly, the Chandigarh Excise Department can only raise a demand notice for recovery of service tax against Gagan Deep and Karan Goel as they are from Kings XI Punjab, a franchise based in the region. The Mumbai Excise Department will have to initiate action against Harbhajan Singh and TP Singh (Mumbai Indians) and Sarabjeet Singh (Delhi Daredevils) as their franchises are Mumbai-based. World chess champion Viswanathan Anand does not wish to become part of the chaos and controversy surrounding the Commonwealth Games here and only wants to focus on the number of medals India would win in the October 3-14 event. “I really don't want to become a part of all this (mess). I don’t wish to comment on what’s going on. At the moment, I am just hoping that we (India) win lots of medals. I am concerned about our medal tally. “I would keenly follow India’s progress in the track and field events. If athletes win medals, it will a great boost to the sport as many of them were waiting for this event to happen,” Anand told PTI here. Anand was in the capital to launch a certificate programme in Chess as 'Mind Booster' to enable development of young minds through the game. The initiative has been launched by NIIT, in collaboration with the IGNOU. Asked about the future of chess in India, Anand sounded optimistic. 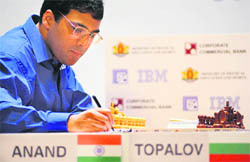 “Future of chess is very bright in India. They are many youngsters who are taking up chess. Through this programme, we aim to encourage young students to play Chess which would enable young minds to develop, and subsequently help them to think logically and improve their life skills,” Anand said. “The reasons behind launching this initiative are manifold. Firstly, chess helps you in the academics as people benefit learning the game and second you will also get people to take the game seriously. The aim is to teach as many people as possible. Mankiran is the daughter of a doctor couple from Sangrur, Dr. Parmbir Singh Klair and Dr. Ravinder Kaur Klair. She has not only brought laurels to Punjab by winning scores of medals in junior and senior national events but has also made her country proud by participating in world school games at Doha in 2009. “Since 2003, she has been participating in the National Swimming Championships. She secured a gold medal at the Senior Nationals in 2008. In 2010, in Junior nationals in Bangalore, she secured a gold and silver in 50 meters breast stroke and 100 meters breast stroke, respectively” said Dr. Parmbir Singh Klair, Mankiran’s father. The girl is a class XIth student at Golden Earth Global Senior Secondary School in Sangrur. “Her ultimate aim is to win a gold medal for India at the London Olympics in 2012”, he adds. Mankiran, who aspires to be a doctor, had a passion for swimming right from her childhood days and had started swimming at the tender age of 7 and won many medals at national level in sub junior category and then in junior and finally in senior category. Dr.Parmbir Singh said it was after her daughter’s exceptional performance in Senior Nationals in Jaipur, in the Commonwealth test event, and Junior national event in Bangalore, that she was selected in the team for CWG. He added that she is presently attending the ongoing camp in Delhi. The occasion was also used to introduce Bollywood heartthrob Bipasha Basu as the ‘Face of Event’ in the presence of Hugh Jones, General Secretary of the Association of International Marathons and Road Races and a member of the IAAF Road Running Commission. Both the teams will put up no-hold-barred efforts to win tomorrow's contest at the floodlit Kingsmead ground here and take another stride to become the first Indian Premier League team to win the show-piece tournament. Riding on a disciplined performance by the bowlers, the Chennai team yesterday snatched a 10-run win over Warriors, and Dhoni would surely expect an encore when IPL champions take the ground. Pacer Ravichandran Ashwin, who scalped three wickets for just 24 runs against Warriors, and his new-ball partner Doug Bollinger would look for some early breakthroughs tomorrow while in the middle overs Suresh Raina's contribution with the ball is expected to be crucial. Chennai spin department would be spearheaded by legendary Sri Lankan Muttiah Muralitharan, while left-arm tweaker Shadab Jakati would have to extend support. CHANDIGARH: Dashing India opener Virender Sehwag will flag off the fourth edition of cyclothon, which will see the participation of over 4,000 participants here on September 26.